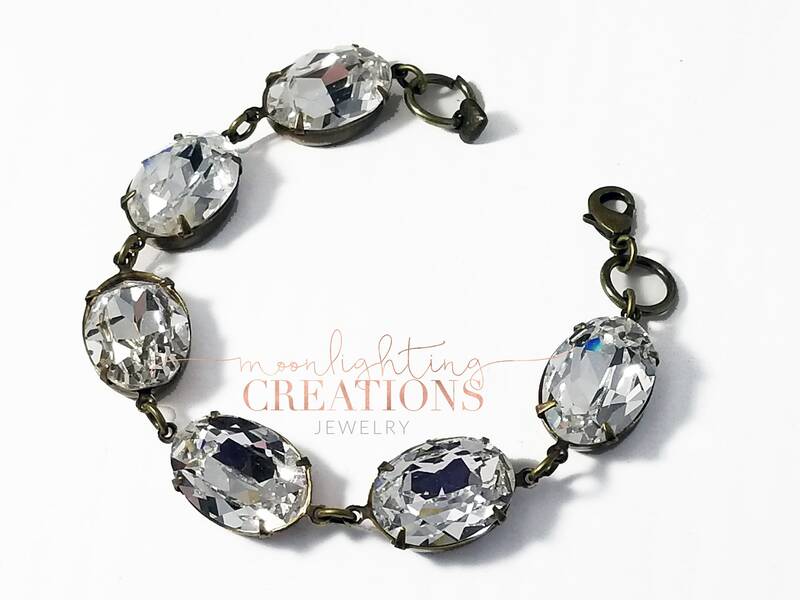 This Swarovski Clear Diamond Crystal bracelet features six brilliant Swarovski crystal clear stones, which are are hand set in antiqued brass settings. The beautiful oval stones measure 18 x 13 mm each, and have foiled backs for extra sparkle. The bracelet measures approximately 7 1/2" in length. If you would like a longer length, I would be happy to add extra links to your custom length. Please use the zoom feature when viewing listing pictures for the best viewing experience. Need more than the quantity available or you would like to have a custom piece of jewelry made to match? Just message me for requests! Please allow time for bracelet to be made.